Silly me has forgotten to add this important condition for the promotion. 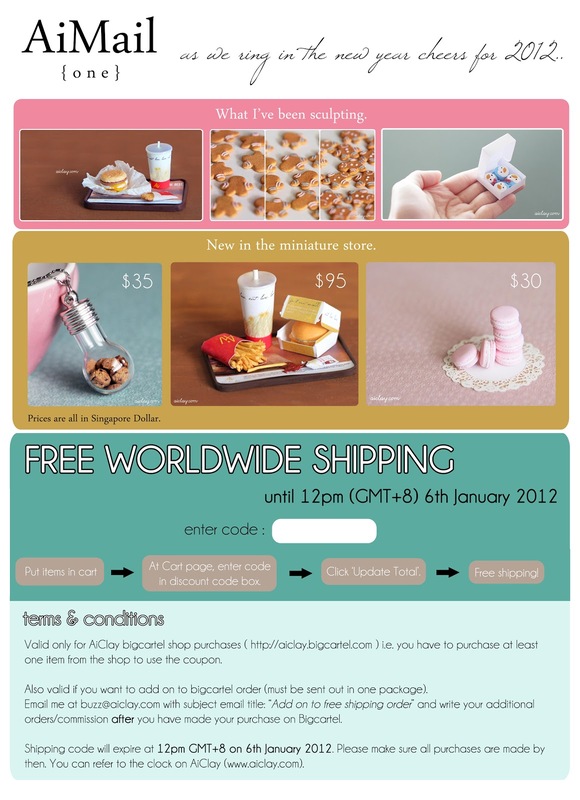 Free worldwide shipping will apply only to orders amounting to at least SGD20. Please forgive all the hiccups with this first issue of AiMail! *if your bigcartel order is less than SGD20 but you want to commission me so that total order is at least SGD20, the promotion will still apply. Please write me an email before 6 Jan, so that I can make a special listing for you! So I finished sending out all copies of AiMail to all subscribers once it hit 31st December 2011, and since it is the very first issue, I think I should show everyone else what a copy of AiMail looks like. Of course the discount code is exclusive only for the subscribers so it was left out of the copy here. I will only send out AiMail to last-minute subscribers till 5 Jan 2012, so email me or click here now if you want to enjoy free-shipping! -cue slow, sappy music for emotional rant ahead. I have always wanted to give back to all of you lovely supporters of AiClay, and I want to do it before the year ended. 2011 was a year when I dived into AiClay full-time and devoted my time and energies into building it. When I'm not sculpting, I'm taking miniature photoshoots, or checking my website statistics, or playing Bejewelled discussing with my customers about their miniature commissions. Maybe you comment on my Flickr photos, or read my blog posts, or check in my store for updates, or a first-time visitor wondering who is this girl who has giant fingers and makes everything look tiny (what a scam tskk). For all of you, I wish for the very best new year ahead of us, in happiness and health. I felt that the best way to show my appreciation for your support during this year is to give free worldwide shipping! I think a part of me feels like for a while, we could pretend we were all next-door-neighbours and forget if we are separated by sea and mountains. I hope I'm making sense haha. I worked really hard at the design of AiMail and love that it has my happy colours in there, but there are many more improvements I can see in future issues. I would definitely include more exclusive, personal AiClay information inside, and hold a variety of promotions for different issues. I have forgotten to include that free worldwide shipping INCLUDES tracking, so while that is going to burn my wallet, I would rather be assured that my customers receive their packages safely. P.S All subscriptions that I receive after 5 Jan 2012 will qualify to receive the second and future issues of AiMail. Happy new year to both of you!! ♥ HUGS!